Lowest Price Online: $749.00 ? The Tamron SP 85mm f/1.8 Di VC USD is an incredibly sharp prime lens in a classic portrait focal length,featuring an image stabilization system that sets it apart from the competition. Extremely sharp. Minimal distortion. Wide aperture. Optical stabilization system. Available for multiple camera systems. Full-frame coverage. Dim corners at wide apertures. Pricey. 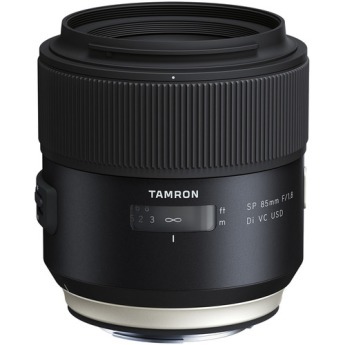 The Tamron SP 85mm f/1.8 Di VC USD prime lens is a fast short telephoto in the classic focal length for portraits. It is also a focal length that usually offers the very best of the lens makers' art, so the standard expected is very high. It is a 35mm-format “full frame” lens. A slightly slower maximum aperture of f/1.8 (many 85mm lenses are f/1.4 designs) does seem to have its advantages in terms of a more compact, lighter lens and also a lower cost. Performance is impeccable, the lens handles superbly and the price well within reason. I rented this lens for a shoot to try it out. I have looked at a few other primes and wanted to see how this one compared. I was not disappointed at all. Very sharp and not much CA when shot wide open at 1.8. All I can say is if you are in the market for an upper end 85mm, look no further. Tamron has hit a homerun with this lens. It is incredibly sharp, has creamy bokeh, built like a tank and is worth every penny I spent. This lens is great! Focus on a Nikon d750, D4 and d810 is fast and spot on.. The bite of this lens is why I'm keeping it and sold my Sigma 85 1.4 that was on occasion sharp and full of ca. The VC works but I shoot mainly in dark clubs and venues and this one is a keeper. I was about to pull the trigger on the Canon L 85mm 1.2 when I discovered Tamrons new 85mm 1.8 DI VC and at a price much more to my liking. I can't express how happy I am with this lens, it is simply fantastic, extremely sharp, creamy bokeh, fast focus, and built like a tank. Wow... I'm not inclined to hyperbole. I'm not easily blown away by a lens, but this is something special. This might be THE must-own lens for Canon and Nikon portrait shooters. I had been shooting with the Nikon 85/1.8g. A truly excellent lens. May have been my favorite lens. Not had much time with it yet but it satisfies some of the issues I've had with my Sigma 85m. The autofocus is great, reliable and works on continuous mode. Images are sharp although VC isn't as useful for the work I do as it might be for some. I have had the lens for about 2 weeks now and man is it sharp. Can be too sharp at times. The VC is wonderful for handheld even at low light. Pictures taken handheld with VC are much more usable and successful. Its not as bulky and heavy as Canon 85 1.2L but much bigger than Canon 1.8. Razor sharp and the VC allows me to take shots that would have been difficult without a tripod.... This lens is solid and well built, not at all plastic feeling like many other lenses. On my D7200, the autofocus is outstanding, bokeh is terrific, "VC" (Tamron's version of Nikon's VR) works well (consistently sharp down to 1/50). The lens is big and heavy compared to the Nikon 85 1.8g, but those are actually benefits, IMO. What is this strange magic? look at the uploaded pictures, this thing has bokeh like no other lens, it cuts with detail like a katana through a soft cantelope!!! But that sharpness works against it too. Instead of giving you a nice skin tone, it shows all the imperfections, even from 5 meters away.